This work was about Andrographis peniculata (Burm. F). Ab initio, the LD50 test showed non-toxi- city at the highest administered dose of 5000 mg/kg in rats. Male albino Wistar rats were treated with daily single doses of ethanol extracts (100/200/500 mg/kg) of Andrographis peniculata (A.p.) for 14 days with intermittent administration, i.p., of CCl4 every four days. Liver and kidney TBARS concentrations showed lower values with increased doses of extract administration. In both cases, “CCl4 + A.p. 500 mg/kg” values compared to “CCl4 + Silymarin” group, while “CCl4 + A.p. 100 mg/kg” showed no significant difference from “CCl4 only” group. The “NC” (normal control) however, presented the least concentration of 66.17 ± 2.74 and 38.04 ± 4.34 nmol/mg protein, respectively. Total and Indirect bilirubin concentrations indicated decreased values with increasing doses, such that respectively, the lowest values of 1.18 ± 0.47 and 0.98 ± 0.31 mg/dl in the “CCl4 + A.p. 500 mg/kg” group were observed. There was no significant difference among all the various groups except the “NC” which showed the least value. Urea and creatinine levels were significantly higher (p ≤ 0.05) in the “CCl4 only” group than all others. Liver function parameters, viz., AST and ALT indicated significantly higher values in the “CCl4 only” group, compared to all others (p ≤ 0.05). Values obtained for “CCl4 + A.p. (500 mg/kg)” were comparable to the “NC” and “CCl4 + Silymarin” groups. 1. Dekkers, J.C., van Doornen, L.J.P. and Kemper, H.C.G. (1996) The Role of Antioxidant Vitamins and Enzymes in the Prevention of Exercise-Induced Muscle Damage. Sports Medicine, 21, 213-238. 2. Valko, M., Rhodes, C.J., Moncol, J., Izakovic, M. and Mazur, M. (2006) Free Radical Metals and Antioxidants in Oxidative Stress-Induced Cancer. Chemico-Biological Interactions, 160, 1-40. 3. Andreyev, A.Yu., Kushnareva, Yu.E. and Starkov, A.A. (2005) Mitochondrial Metabolism of Reactive Oxygen Species. Biochemistry (Moscow), 70, 200-214. 4. Zhang, X. (2004) WHO Monograph on Selected Medicinal Plants. Vol. 2, World Health Organization, Geneva. 5. Chen, W. and Liang, X. (1982) Deoxyandrographolide19β-D-Glucoside from the Leaves of A. paniculata. Planta Medica, 15, 245-246. 6. Rajagopal, S., Kumar, R.A., Deevi, D.S., Satyanarayana, C. and Rajagopal, R. (2003) Andrographolide, a Potential Cancer Therapeutic Agent Isolated from Andrographis paniculata. Journal of Experimental Therapeutics & Oncology, 3, 147-158. 7. Kumar, R.A., Sridevi, K., Kumar, N.V., Nanduri, S. and Rajagopal, S. (2004) Anticancer and Immunostimulatory Compounds from Andrographis paniculata. Journal of Ethnopharmacology, 92, 291-295. 8. Calabrese, C., Berman, S.H., Babish, J.G., Ma, X.F., Shinto, L., Dorr, M., Wells, K., Wenner, C.A., et al. (2000) A Phase I Trial of Andrographolide in HIV Positive Patients and Normal Volunteers. Phytotherapy Research, 14, 333-338. 9. Pratibha, S., Srivastava, M.M. and Khemani, L.D. (2009) Renoprotective Effects of Andrographis paniculata (Burm. f.) Nees in Rats. Upsala Journal of Medical Sciences, 114, 136-139. 10. Bruck, R.R., Hershkoviz, O., Lider, H., Aeed, L., Zaidel, Z., Matas, J.B. and Halpern, Z. (1996) Inhibition of Experimentally-Induced Liver Cirrhosis in Rats by a Nonpeptidic Mimetic of the Extracellular Matrix-Associated Arg-Gly-Asp Epitope. Journal of Hepatology, 24, 731-738. 11. Noori, S., Nayab, R., Madiha, Q. and Tabassum, M. (2009) Reduction of Carbon Tetrachloride-Induced Rat Liver Injury by Coffee and Green Tea. Pakistan Journal of Nutrition, 8, 452-458. 12. Anand, B.S. (1999) Cirrhosis of Liver. Western Journal of Medicine, 171, 110-115. 13. Ozbek, E. (2012) Induction of Oxidative Stress in Kidney. Hindawi Publishing Corporation. 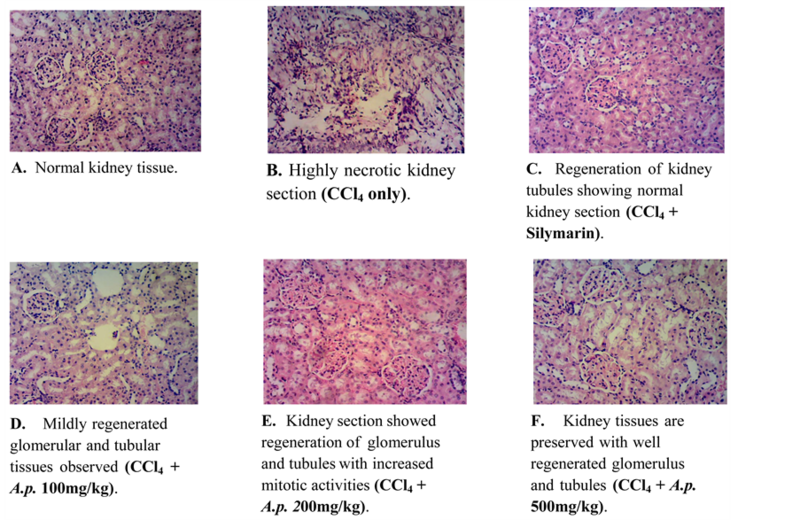 International Journal of Nephrology, 2012, Article ID: 465897. 14. Hinds, T.S., Wesk, W.L. and Knight, E.M. (1997) Carotenoids and Retinoids: A Review of Research, Clinical and Public Health Applicationsz. The Journal of Clinical Pharmacology, 37, 551-558. 15. We, Y.T., Liu, D.W., Ding, L.Y., Li, Q. and Xiao, Y.H. (2004) Therapeutic Effects and Molecular Mechanical of Antifibrosis Herbs and Selection on Rats with Hepatic Fibrosis. World Journal of Gastroenterology, 10, 703-706. 16. Adejo, G.O., Atawodi, S.E., Ameh, D.A. 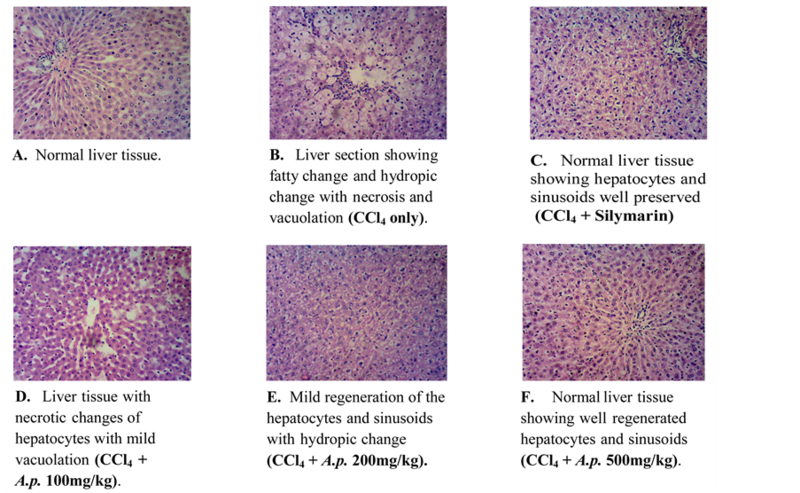 and Ibrahim, S. (2014) Anti-Peroxidative, Protective and Ameliorative Properties of Methanol Extract of All Parts of Morinda Lucida Benth in CCl4-Induced Liver Injury. Natural Products Chemistry & Research, S1, 003. 17. Mishra, B.B., Gautam, S. and Sharma, A. (2006) Microbial Decontamination of Tea (Camellia sinensis) by Gamma Radiation. Journal of Food Science, 71, M151-M156. 18. Gyamfi, M.A., Yonamine, M. and Aniya, Y. (1999) Free-Radical Scavenging Action of Medicinal Herbs from Ghana: Thonningia sanguinea on Experimentally-Induced Liver Injuries. General Pharmacology, 32, 661-667. 19. Usoh, I.F., Akpan, E.J., Etim, E.O. and Farombi, E.O. (2005) Antioxidant Actions of Dried Flower Extracts of Hibiscus sabdariffa L. On Sodium Arsenite-Induced Oxidative Stress in Rats. Pakistan Journal of Nutrition, 4, 135-141. 20. Lorke, D. (1983) A New Approach to Practical Acute Toxicity Testing. Archives of Toxicology, 54, 275-287. 21. Ohkawa, H., Ohishi, N. and Yagi, K. (1979) Assay for Lipid Peroxides in Animal Tissue by Thiobarbituric Acid Reaction. Analytical Biochemistry, 2, 351-358. 22. Adejo, G.O., Agbali, F.A. and Otokpa, O.S. (2015) Antioxidant, Total Lycopene, Ascorbic Acid and Microbial Load Estimation in Powdered Tomato Varieties Sold in Dutsin-Ma Market. Open Access Library Journal, 2, e1768. 23. Singh, A.P. (2005) The Lost Glory of Folk Medicine. Ethnobotanical Leaflets, 2005, 29. 24. Tsukamoto, H., Matsuoka, M. and French, S.W. (1990) Experimental Models of Hepatic Fibrosis: A Review. Seminars in Liver Disease, 10, 56-65. 25. Recknagel, R.O., Glende, E.A., Dolak, J.A. and Waller, R.L. (1989) Mechanisms of Carbon Tetrachloride Toxicity. Pharmacology & Therapeutics, 43, 139-154. 26. Deshwal, N., Sharma, A.K. and Sharma, P. (2011) Review on Hepatoprotective Plants. International Journal of Pharmaceutical Sciences Review and Research, 7, 15-26. 27. Bhragual, D.D., Kumar, N., Garg, V.K. and Sharma, P.K. (2010) Review on Plants Having Hepatoprotective Activity. Journal of Pharmacy Research, 3, 2077-2082. 28. Brent, J.A. and Rumack, B.H. (1993) Role of Free Radicals in Toxic Hepatic Injury. Clinical Toxicology, 31, 173-196. 29. Seakins, A. and Robinson, D.S. (1963) The Effect of the Admin-Istration of Carbon Tetrachloride on the Formation of Plasma Lipoproteins in the Rats. Biochemical Journal, 86, 401-407.